It’s UK Disability History Month, which is a good time to reflect on disability history and what it means for today. 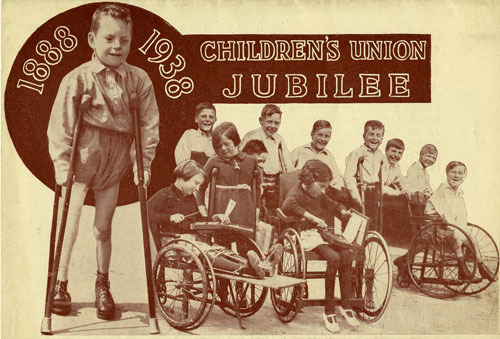 The Children’s Society has helped disabled children ever since it was founded in 1881; this means that our collections here at The Children’s Society Archive can tell a lot about the history of disabilities and attitudes to them over the past 130 years. Two years ago we finished a project called Including the Excluded, which catalogued and preserved our archival collections relating to The Children’s Society’s work with disabled children. 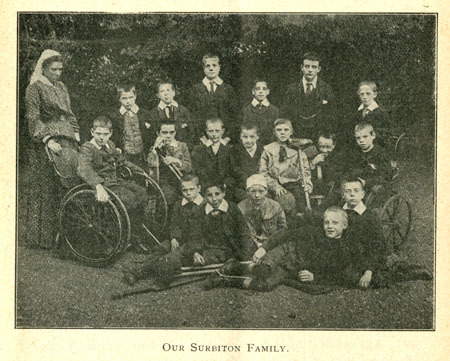 Click here to visit the project’s webpages and find out more about The Children’s Society’s work with disabled children (and to see catalogues of the documents we hold that can be used to study disability history). We blogged about the Including the Excluded project as we went along, so check out the Including the Excluded category to see the stories and insights that we came across. It’s been a successful year here are Records and Archives Centre, with the Including the Excluded project completed and the cataloguing of even more of our collections well underway. Time, I think, for a well-deserved celebration. Christmas has always been a special time for The Children’s Society. In the children’s residential homes, staff would work hard to ensure that the children they looked after were able to fully enjoy and celebrate the season, as is evidenced by the decorations and the visit from Father Christmas in the above photo from St Nicholas’ Home in Byfleet. For more Christmas-themed images from our archive, please visit The Children’s Society’s main blog where our Records, Archive and Data Protection Manager, Ian Wakeling, has shared a great selection. From everyone here at The Children’s Society Records and Archives Centre, I’d like to wish you all a Merry Christmas and a Happy New Year! Following on from my last post, I am happy to announce that the Including the Excluded project has now been completed. In addition to cataloguing The Children’s Society’s records that relate to the care of disabled children, we have repackaged 600 of our children’s case files, making them easier to use and preserving them for the future. This blog has allowed me to highlight some of the interesting items that I have found amongst The Children’s Society’s records. 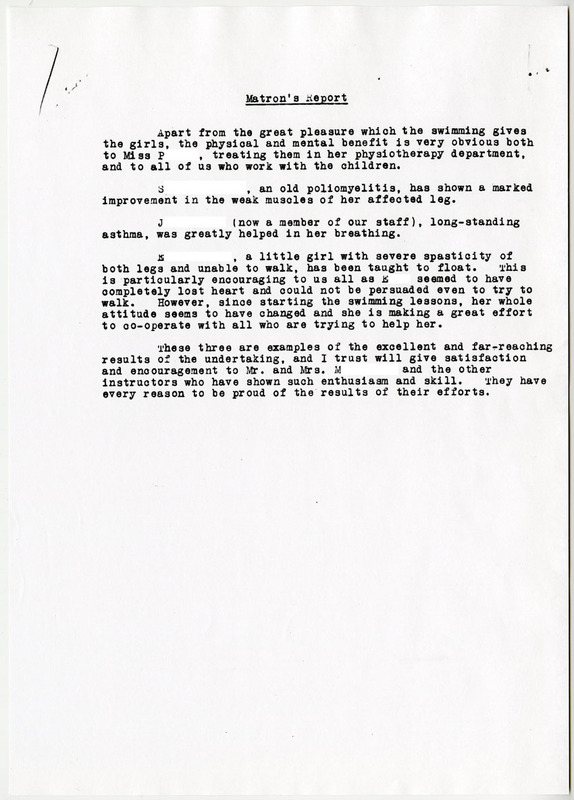 If you would like more information, we also have summaries of the stories found in some of the children’s case files, giving examples of what life was like for disabled children in care in the late-19th and early-20th centuries. As fascinating as the items and case files we’ve selected here are, they’re just the tip of the iceberg. Looking into any of the records that have been catalogued as part of this project will reveal information about disabled children in The Children’s Society’s care, what life was like for them, and how attitudes to disability have changed over the years. Thanks to Including the Excluded, many of the catalogued records are now available to view in person by making an appointment at The Children’s Society’s Records and Archives Centre in London. If you are interested in the records we hold that relate to the care of disabled children, please do take a look at our catalogues. Information on how to make an appointment to view the records can be found at the front of each catalogue. Many thanks to our volunteers and to all my colleagues who have helped to make this project a success. I am happy to announce that the cataloguing for the Including the Excluded project is now complete. The completed catalogues can be downloaded in pdf format on this page. Case files for the majority of children born in 1911 or before who were placed in one of The Children’s Society’s specialist homes for disabled children. 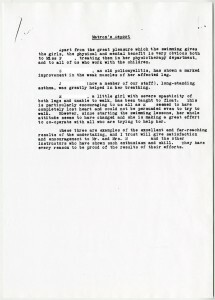 The records of the Children’s Union. Many of the records listed in these catalogues are available to view, in person, here at The Children’s Society’s Records and Archives Centre in London. More information about which records are available to view and how to book an appointment to see them can be found at the front of each pdf document. Today’s post is written by Rod Cooper, one of the volunteers helping us with the Including the Excluded project. As part of the project some of the volunteers have been writing summaries of a selection of case files; the aim is to highlight examples of the experiences of disabled children while in The Children’s Society’s care. The following is an account of a boy who came into The Children’s Society’s care in its earlier years – 1895 – when it was known as the Waifs and Strays Society. Case File 4688 – John Robert Hall – is interesting as it illustrates the various approaches employed by The Society to help and assist children, and prepare them for a fulfilling and self-supporting adulthood. John was born disabled (he suffered an impairment to his left hip) and into an extensive but immeasurably poor family, supported entirely and solely by the endeavours of their mother, Elizabeth Hall. John’s family lived in Huntingdon. An unusual aspect of John’s case is the support provided by a local peer. In preparing his application, a supporter solicited the interest of the local Earl of Sandwich. After visiting the child and his family, Edward Montagu, 8th Earl of Sandwich, agreed to bear the cost of John’s care for its duration. 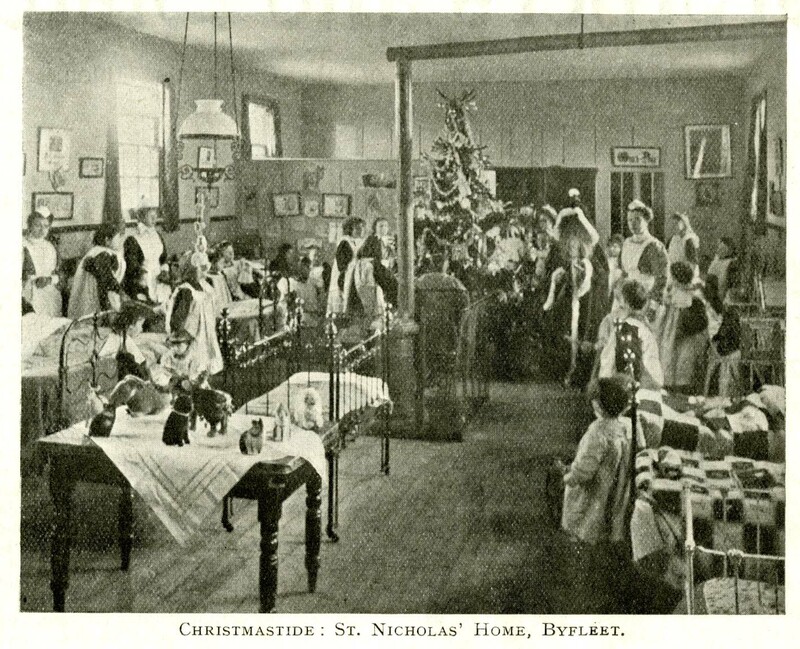 John entered The Society’s St Nicholas Home for Crippled Children at Byfleet, Surrey, in 1895, as a seven year old. He remained there for little more than one year, and because it was deemed that he did not require either specialist nursing or surgical treatment, he was considered a good candidate for boarding out. Consequently, in mid-1896, he became a foster child under the care of a Mrs Hinchley, who lived in the small village of Bunwell in Norfolk. John remained with Mrs Hinchley until late-1902. Throughout the period of his fostering in Bunwell, The Society maintained an interest in John’s progress and development, before deciding in December 1902 – shortly before his 16th birthday – that he was suitable for placing in one of The Society’s industrial schools, specifically for learning the trade of tailoring. Consequently, John was provided with a place at The Society’s Industrial School in Copenhagen Street, Islington. There is no indication on John’s file of whether or not he was in contact with, or was contacted by, his mother, during the period since entering the care of The Society. However, in early 1903, The Society did hear from John’s mother with the news that she was to marry the following Easter, and that she wished her son to be returned to her. John’s mother had moved to London and was employed as a housekeeper. After consulting with the various interested parties – including John’s benefactor and those who had prepared his initial application – The Society returned John to his mother in February 1903. It is also evident from his file that he had recently commenced his apprenticeship as a tailor. 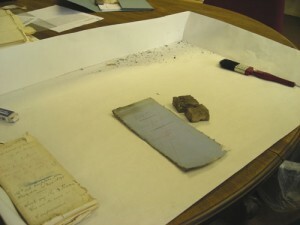 Here we have a guest post written by one of our archivists, Gabrielle St John-McAlister. 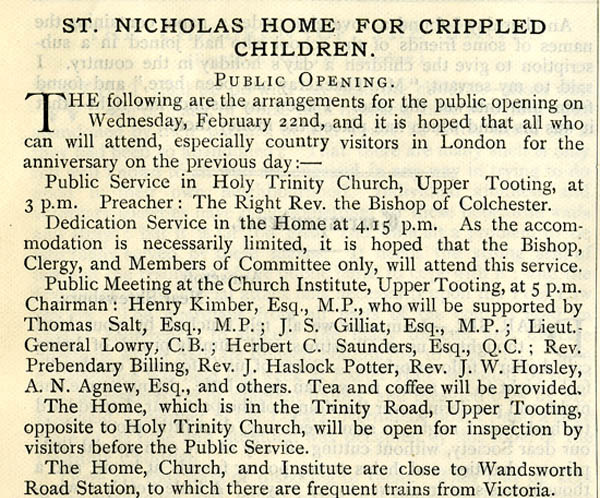 In previous posts we have read about St Nicholas’ Home in Tooting being the first of The Children’s Society’s homes for disabled children. 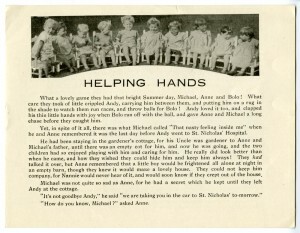 In this post I wanted to give a bit more detail on what was a momentous occasion in The Children’s Society’s history. What with 2012 being a Jubilee year, it is interesting to see that good deeds were done to mark another, much earlier, Jubilee of a well-loved monarch. To commemorate Queen Victoria’s Golden Jubilee, in May 1887 The Society set up a fund to establish and endow a home for disabled children. This became know as St Nicholas’ Home, Tooting. As the Case Committee frequently saw children in need of surgery and surgical appliances, and because The Society had great difficulty in providing appropriate care, they felt strongly that there was a clear need for a home which could meet the real needs of disabled children. The appeal was so successful that within six months Talgarth House on Trinity Road, Tooting, had been leased. There was a huge amount of goodwill towards the endeavour in the area: a number of local physicians offered their services free of charge as honorary medical officers and a Miss Anne Anderdon promised £100 per year to meet the home’s rent and taxes. The next step was to renovate and fit out the premises, and gifts of beds, bedding, pictures and fireguards were sought. 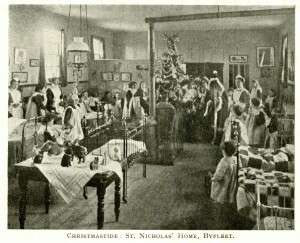 By December 1887 enough gifts had been received for St Nicholas’ Home to open, with the official opening and dedication taking place in February 1888. The text below, taken from The Society’s supporter magazine ‘Our Waifs and Strays’ in 1888, gives some more information about the public opening of the Home. 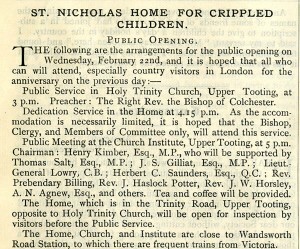 Further information about St Nicholas’ Home in Tooting can be found in the homes section of Hidden Lives Revealed. As we are coming up to the Queen’s Diamond Jubilee, today I have decided to highlight just one of the links to the Royal Family that can be found within our collections. 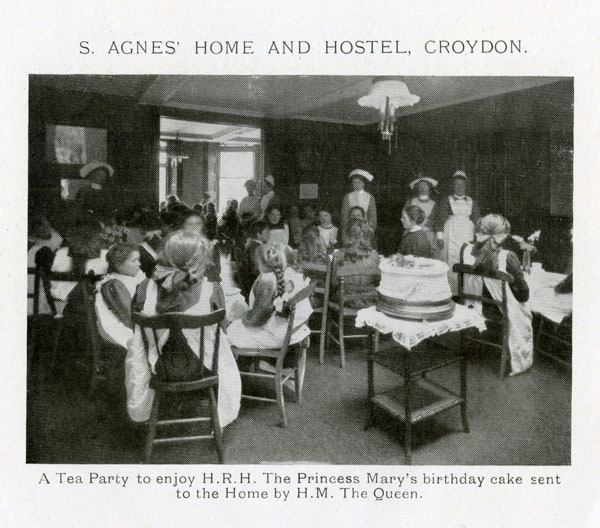 St Agnes’ Home in Croydon was a children’s home that took in disabled girls, aged 14 and above. The home focussed on teaching the girls manual skills such as knitting, basket weaving and needlework. 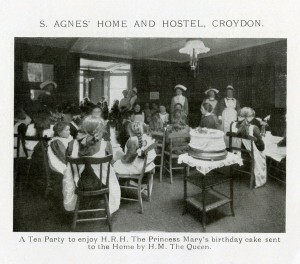 I am commanded by The Queen to send Princess Mary’s Birthday Cake to St Agnes’ Home & Hostel Croydon. The cake was sent to the home the next day. In order to eat it, a special tea party was held for the all the girls at the home. The above photograph, taken from the 1914 Children’s Union annual report, shows the girls at the home, ready to enjoy their tea party. This may have been one of the more unusual donations that have been made to The Children’s Society over the years, but it is easy to imagine that it went down very well with the girls in the home. Further information about St Agnes’ home can be found in the homes section of Hidden Lives Revealed. Previously, I talked about how our case files relating to disabled children are being repackaged by a team of volunteers. Today, I thought I’d let our volunteers explain what it’s been like to help with this project. The photo below shows one of the case files in the process of being cleaned with chemical sponges. Thankfully, not all the case files are so badly damaged, but it just goes to show how valuable the repackaging process is. Placing the files into archival folders protects the documents from all sides, which prevents them from sustaining further damage. When it comes to what the volunteers enjoy most about the project, the answers varied. Some of the volunteers said they value the practical experience they are able to gain when it comes to cleaning and handling the historical documents, and some volunteers said they particularly enjoy the atmosphere in the office. For most of the volunteers, though, it is the stories found in the case files that are the really interesting part. I would like to thank all our volunteers for taking the time to answer my questions and for helping to preserve our case files for the future! While working with historical records relating to disabled children, it is very hard not to come across attitudes and phrases that can seem discriminatory and relatively demeaning when set alongside 21st Century standards and attitudes. When reading these records, it is necessary to keep in mind that these were attitudes and phrases that were common in their day and were unlikely to have been seen as discriminatory by those using them. The records act as a body of evidence for how society saw disabled children in the past and how much has changed for the better in the intervening years. In the above example, we have a page from a story booklet for children that was produced in c1930 by the Children’s Union. This booklet was created to teach children about the work of St Nicholas’ Home for disabled children in Pyrford, Surrey, with the aim of persuading them to donate money to the home. The first thing that we come across in this example is the use of the word “crippled”. This term was very common in the 19th and early-20th Centuries and crops up very often in our records relating to disabled-children’s homes. Secondly, when reading through this first part of the story, we begin to get a perception of how disabled children were seen at the time. Andy, the disabled boy, is described in a way that emphasises vulnerability and helplessness, with the aim of provoking a feeling of pity in the reader. 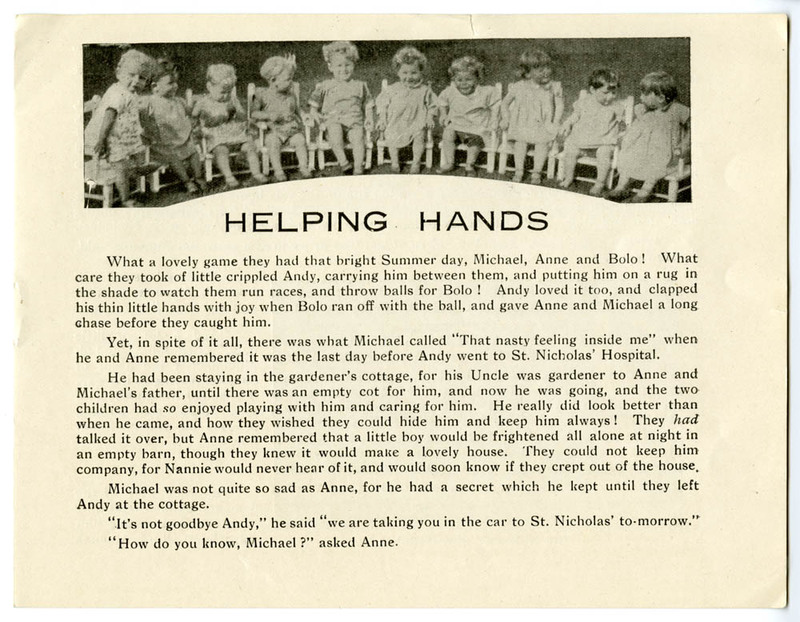 Language like this is found in a lot of early publicity material for the Children’s Union; this material often talks about the disabled children being unfortunate and needy. Presumably, urging the public to feel pity was seen as a good way of motivating them to donate money for the disabled-children’s homes. It is also clear that the focus at the time was very much on the medical model of disability and orthopaedic care. Disabled children’s homes often doubled as hospitals and were seen as places to treat medical conditions. The aim of the Children’s Union, as stated later in the above story, is to “help poor ill children, and make them well and strong”. Children with disabilities that could not be treated medically and children that were not able to learn a trade, were often seen as a group of people for whom nothing could be done; an unfortunate perspective. As the 20th Century moved on, attitudes towards disability began to change toward a more social model, and we can see this reflected in the records. Above is a page from a prospectus for Halliwick Further Education and Training Centre in Winchmore Hill, London, made c1980. While this prospectus also uses terms that are no longer common today, we can see that the attitude towards disability was quite different from that in the earlier document. The aim of the Centre was no longer about medical treatment to remove disabilities that were seen as obstacles. Instead, the aim of the Centre was to provide further education that was tailored and accessible to the disabled students, to provide them with the same opportunities for education as non-disabled children. Examples like those above allow us to see how attitudes towards disability have changed over the years to become what they are now. I think it is very important that these records are preserved for the future and not hidden from history purely because they contain phrases that can be seen to be discriminatory or, indeed, offensive. After all, it is only by learning how things were that we can understand why and how things needed to change and where we need to go in the future.